Now here's a book that I felt I absolutely had to love from the moment that I first picked it up. THE book of the 2013 Bologna Book Fair, Half Bad by Sally Green is talked about in breathless voices tinged with excitement. It's a book where the hype is huge among all quarters, and because it's YA it's even more impressive that adults seem to be harping on about it too. Nathan is a witch, but the only problem is, he's half Black, half White witch. Growing up in a family of White witches (his grandmother as caretaker, his kind older brother and one sister, his evil oldest sister) doesn't stop the witch council from wondering whether Nathan will turn out fully Black or White. After all, Nathan's father is the most evil Black witch out there. To keep him under control until his 17th birthday, when Nathan becomes a fully fledged witch, the council of witches issue a series of edicts to ensure his life is lived within narrow boundaries, before abandoning all sense of propriety and basically kidnapping and torturing him to keep him on their side. 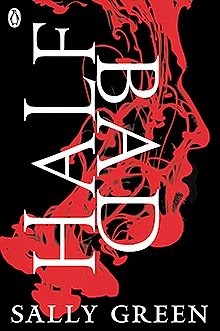 Half Bad is told through Nathan's eyes, and follows him from a young child until his 17th birthday. We learn he can't read and write, and that people barely try helping him before they give up. For me, this was one of the things that really made me feel for Nathan, but that may just be because I'm a huge advocate of getting kids reading. We also learn that Nathan longs to meet his father, even if he is a Black witch who has killed many, many people. Nathan's voice is interesting, but I wasn't ever enthralled by it. Green's telling of Nathan's story is episodic in some ways, full of short scenes and short sentences, but I think for an epic tale of good vs evil, nature vs nurture, a sentence and scene structure with a bit more depth would have been more appropriate. As it is, everything seems a bit sudden and broken. I guess that's a reflection of Nathan himself, and the fact that his vocabulary isn't extensive, but I personally didn't love it. I also have some issues with the way other characters treat Nathan. The council of witches, for example, constantly punish him for who his father is, even though they want to keep Nathan on side. It seems to me that it's an extremely stupid bunch of people who don't realise punishment is no way to get a child onside. I could understand it if one person was treating Nathan in that way, but it's the whole of White witch society (apart from three members of Nathan's family and one other person). Seriously? How stupid are these people? And then there's the romance element, which I didn't quite find myself invested in. From the moment he sees her, Nathan falls in love with White witch Annalise, whose family are horrible. His love for her continues throughout the book, even though his encounters with her are few and far between. I just couldn't believe enough to root for this relationship, not when there were far more compelling ones in the book that were nothing to do with romance. Nathan's connection with his brother was lovely, as was his burgeoning friendship with Gabriel. Both were sensitive, nuanced relationships, of the kind rarely seen between two boys in fiction. Half Bad is the first in a trilogy by Green, and it's not a bad start. It's also not a thrilling one, and definitely not the one I was hoping for. While I read the whole of Half Bad, it was done with more of a sense of resignation as the stories progressed. I'm hoping, that now that all the exposition is out of the way in Half Bad and now that some of the pressure of such a hyped first book is out of the way, Green can really get going in books two and three. Cross your fingers. How I got this book: From the publisher, Penguin. This did not affect my review. I see reviews for this one all over the place. Some people really like it while others don't. I will for sure pick this one up though because the buzz for sure has me interested in it. I definitely think it's worth a read, but it wasn't as strong as I expected it to be. I suspect my expectations were too high! I work in the media industry, and have a voracious appetite for news, books and great (and rubbish) television. Herein you'll mostly find reviews of the things I'm reading and watching, plus occasionally the places I'm going and the things I'm eating.